Between the number of pitchers they used and the cramped quarters of their dugout, Spokane Indians players would have had a hard time following the tradition of avoiding their teammates working on a no-hitter. That just made the celebration even better. Four Rangers prospects combined on the first extra-inning no-hitter in Northwest League history Sunday as Short-Season Spokane outlasted Everett, 3-0, in 11 innings at Everett Memorial Stadium. It wasn't just Indians starter Derek Thompson who set the tone for Sunday's stingy evening on the mound. AquaSox counterpart Ryan Yarbrough matched Thompson with three perfect innings in the opener of a three-game series. "Their lefty threw three perfect innings against us as well," Indians manager Tim Hulett said, "and I was like, 'Wow, this is going fast.' You never think you're going to throw a nine-inning no-hitter, let alone an 11-inning one." 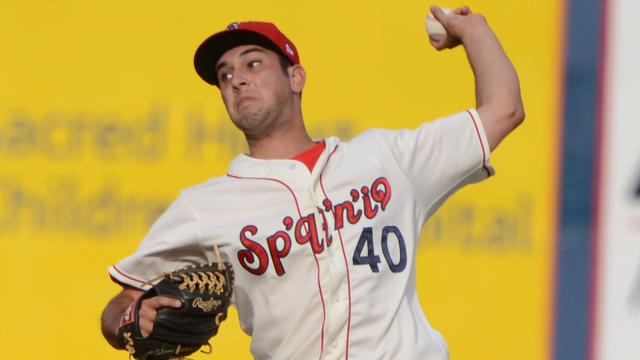 While Spokane got into the hit column repeatedly through the middle innings, Everett could not. Thompson struck out five and walked one over five innings and Shane McCain followed with three perfect frames, matching Thompson's strikeout total. The Indians were accumulating hits but couldn't crack the scoreboard. They collected three singles in the fourth inning, two more in the sixth and two in the eighth but never came through with runners in scoring position. "We do a pretty good job swinging the bats," Hulett said. "We've had a good year. Guys got off to good starts and they've really managed to keep it going. We had our opportunities. We had guys on first and second in the sixth inning, I believe, with nobody out and couldn't score. We had another opportunity with guys in scoring position and just couldn't get the big hit." As the scoreboard turned over to extra innings, the Indians kept the no-hit bid intact. Adam Parks (2-1) followed McCain with two perfect frames, striking out three, to send the deadlock to the 11th. "I just felt like the guys that got it done were the guys that were going to get it done," Hulett said. "They've swung the bats well all year in the middle of our lineup. Spivey with a one-out double and then they walk Trevino, which was smart, lefty on righty with a lefty on deck. They just made a bad pitch to Tendler. "[Tendler] looked good all day. I just felt like he had one of the better opportunities to hit it out. They've got a short porch in right field, but he didn't need the short porch. He went ahead and hit it far." The homer set off a raucous celebration in an Indians dugout that was waiting for the big hit to finally arrive. "They all knew it right away," Hulett said. "They all jumped up and were ready to celebrate." Three outs in the bottom of the 11th were all that stood between Spokane and its first no-hitter since Sept. 3, 2002, when Gregory Atencio threw eight frames and Justin Taylor finished the feat with one. Hulett turned to southpaw Luis Pollorena. "We've got Pollorena on the mound," he said, "who is our soft-tossing lefty who's in there throwing 88, 89 mph. He's usually pitching at 83-85, maybe. The adrenaline was really pumping on him." Pollorena retired leadoff man James Alfonso on a fly ball before issuing a one-out walk to Andy Peterson that gave Everett its first baserunner since the fifth inning and snapped a streak of 18 straight AquaSox retired. Pollorena rebounded and set down Isaiah Yates on another flyout. After working a two-strike count on pinch-hitter Kyle Petty, Pollorena missed with two close pitches before finally catching Petty looking to record his third save and touch off another even bigger celebration. "We finally get the last one and the guys poured out of the dugout and out of the bullpen and celebrated on the field," Hulett said. "It's so much fun. It doesn't matter how many times you celebrate. When you do something spectacular in the game of baseball, it's so much fun to watch guys celebrate their hard work." Tyler Maun is a contributor to MiLB.com. Follow him on Twitter @TylerMaun. This story was not subject to the approval of the National Association of Professional Baseball Leagues or its clubs.